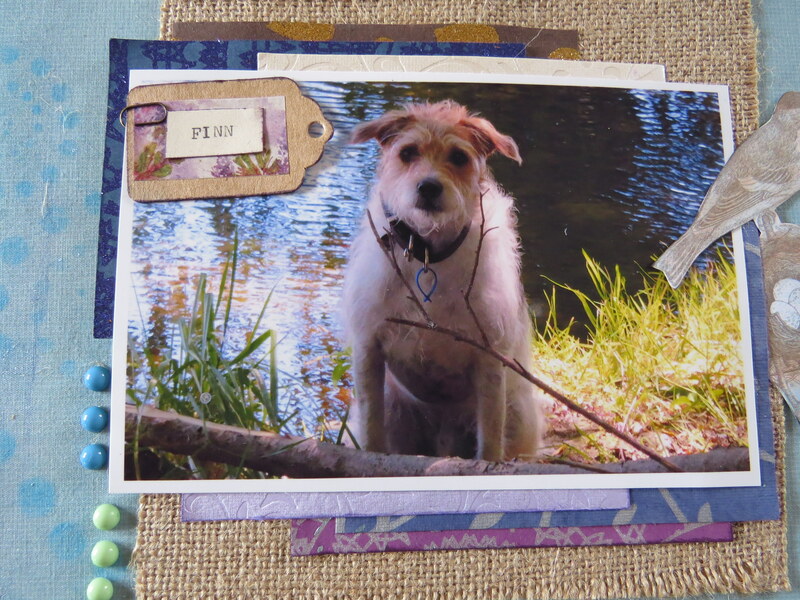 We recently celebrated Finn’s third birthday with a trip to one of his favourite river spots, where he loves to run, explore, swim and chase sticks. 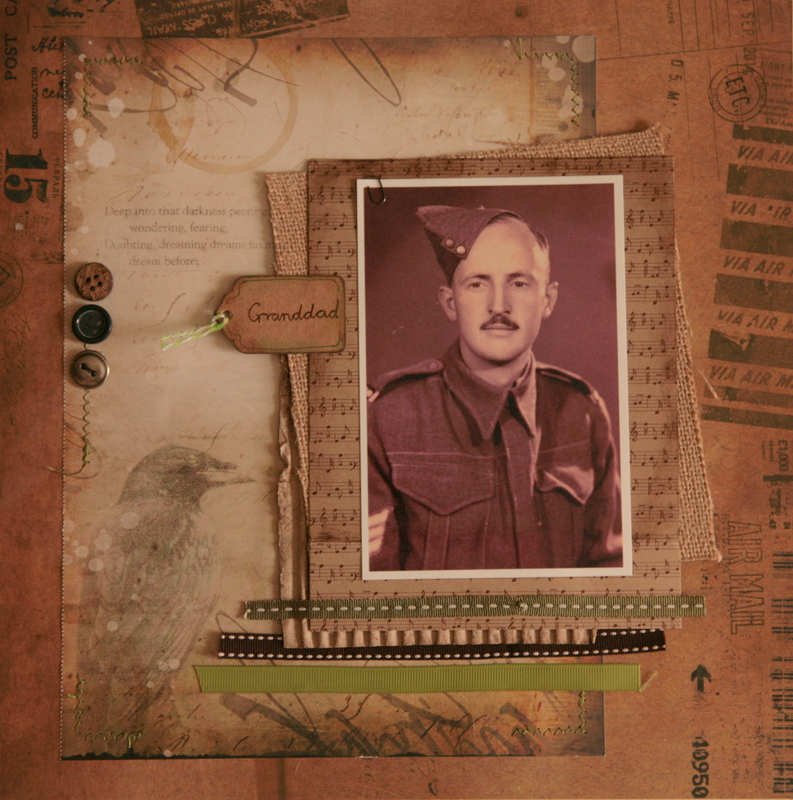 I made this scrapbook page for his album, which is filling up fast. Here are some close-ups of the details. I love to layer papers. The burlap gives it a natural feel. I used collage elements and did some chalking through stencils. 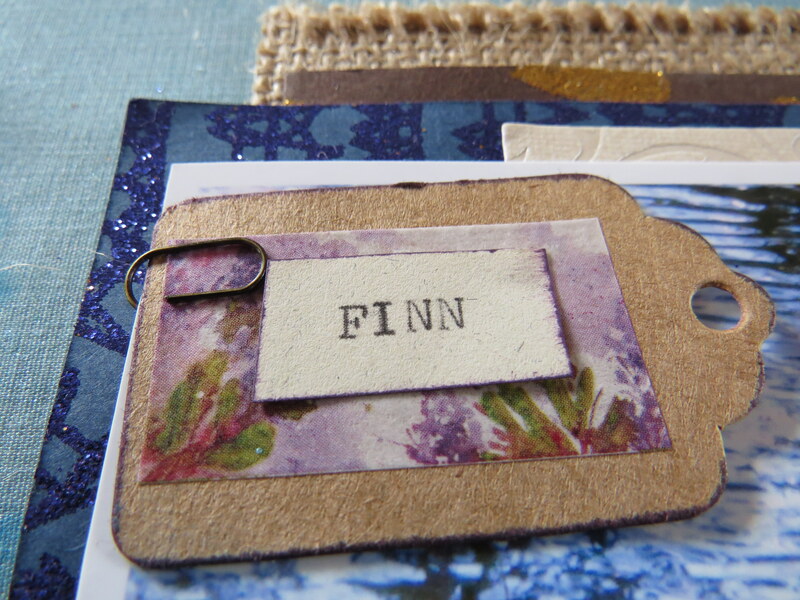 Washi tape and ribbon co-ordinate with the colour theme of water and nature. 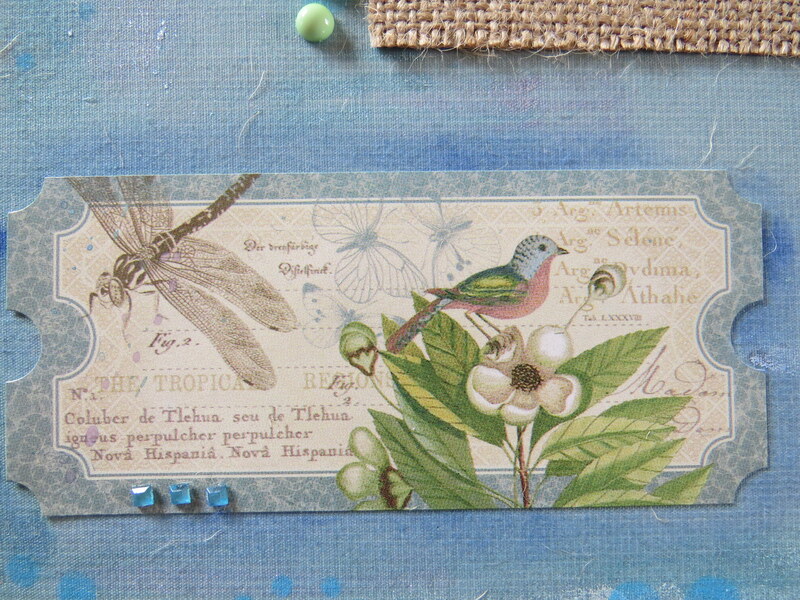 This pretty sticker was from Graphic 45’s Botanical Tea collection. I have always been a list maker. Each morning I write a list of things I want to achieve that day. Sometimes I write it out the night before so that I can go to sleep without going over in my mind what I need to do the next day. At the end of the day I take pleasure in crossing off the tasks I have completed and feel a sense of achievement if I have managed to accomplish them all. This year I decided that, instead of having lists lying around the house, I would make a planner where I could keep everything organised in a fun, creative way. 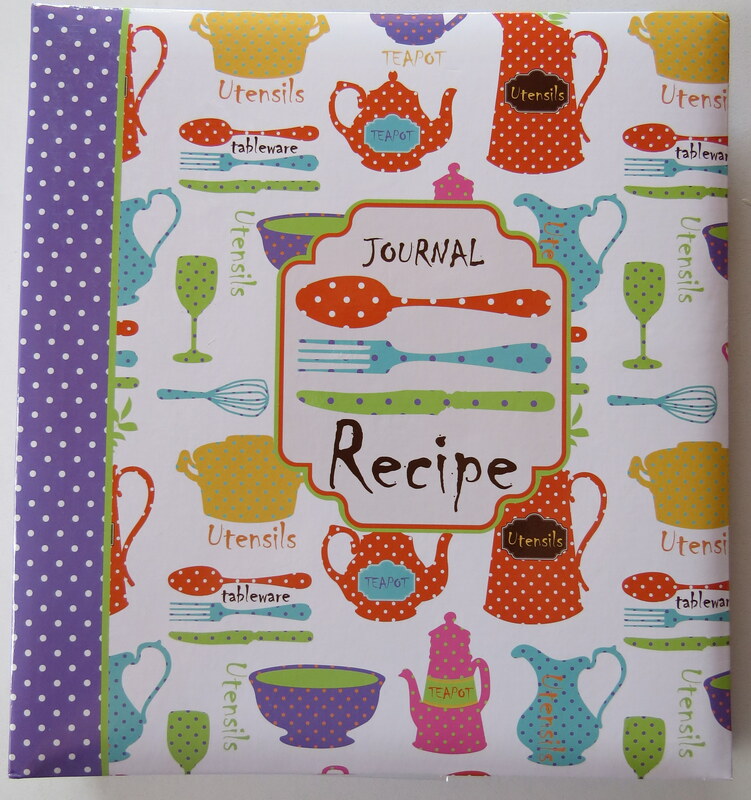 Although there are lots of lovely planners you can buy, I decided to use a recipe journal I have had for a few years, but never used. 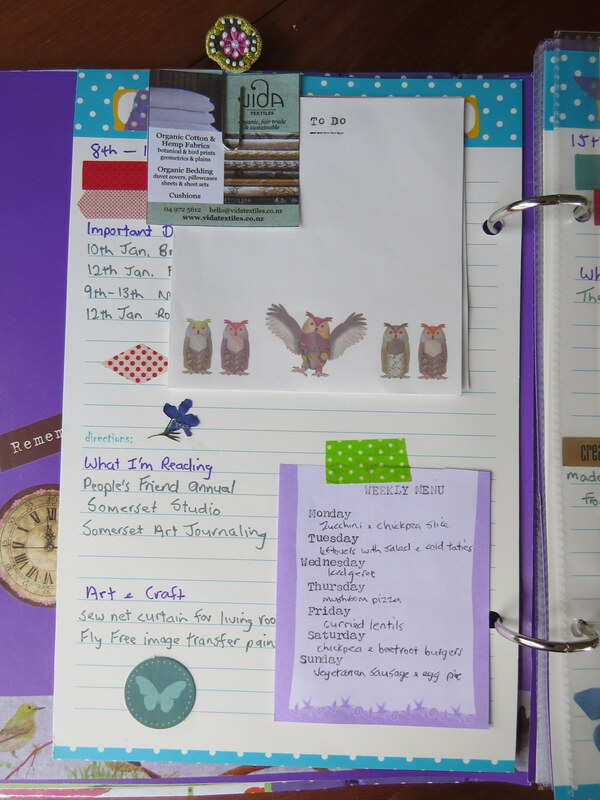 I think I bought it because it was purple, my favourite colour, but I have another lovely recipe folder that I have been using, so this one has been stashed away in a cupboard until now. 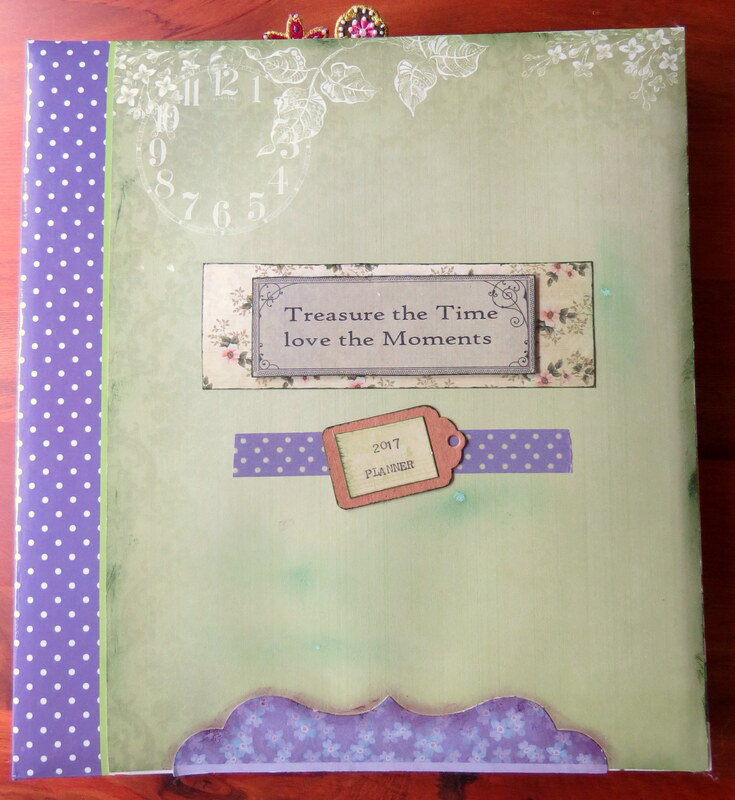 I decorated the front with scrapbook papers and a small tag, and I also decorated the back and inside cover. The journal has six dividers so I have 2 months for each divider and use word stickers for the months. 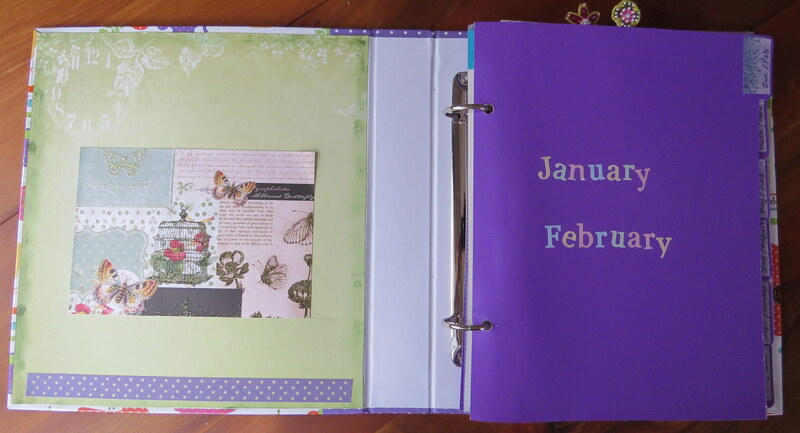 On the inside of the divider I glued small calendar pages so I can see the dates at a glance. I use a page for each week and write down important dates, what I’m reading, art and craft projects I’m working on, and weekly menus. At the top I attach a stack of To Do notelets with a paper clip so that at the end of each day I can transfer any tasks I haven’t completed to a new list and throw the old one away. The paper clips are also handy for keeping snippets I have clipped from magazines or junk mail, of things I want to remember or look up on the Internet. 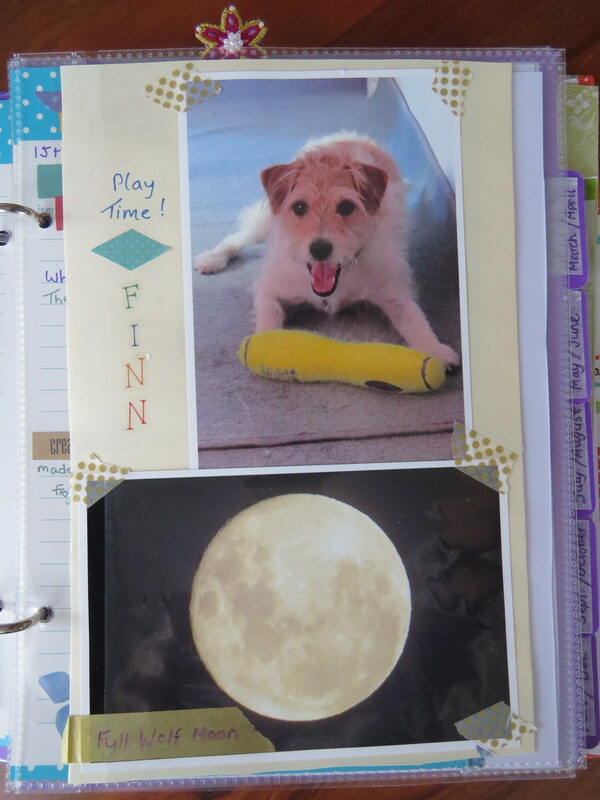 I attach the weekly menu to the page with washi tape so that I can easily take it off at the end of the week if I want to, and in its place I put pictures for art inspiration that I have cut out of catalogues or magazines. Plastic sleeves provide a place for photos taken during the week. 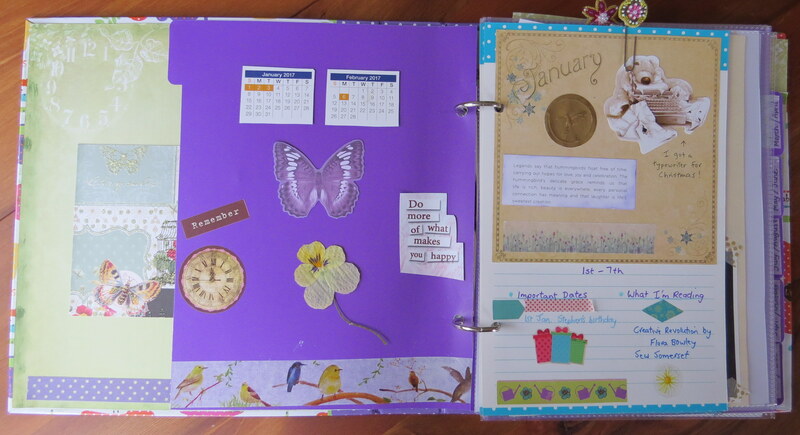 I set the pages up a month at a time so I can easily write out my lists each day, and then when I have time I can add embellishments like stickers, decorative tape, and pressed flowers from my garden. 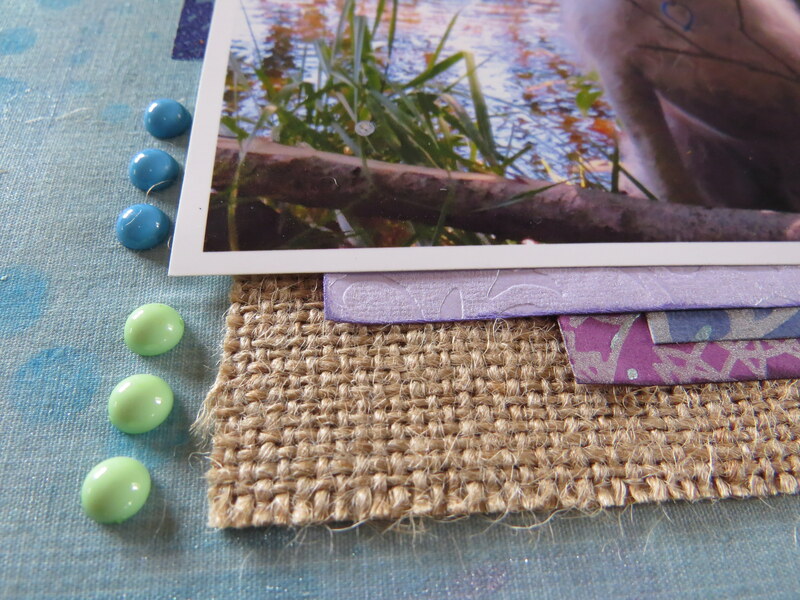 I find it is a fun and creative place to keep things organised – everything together all in one place. 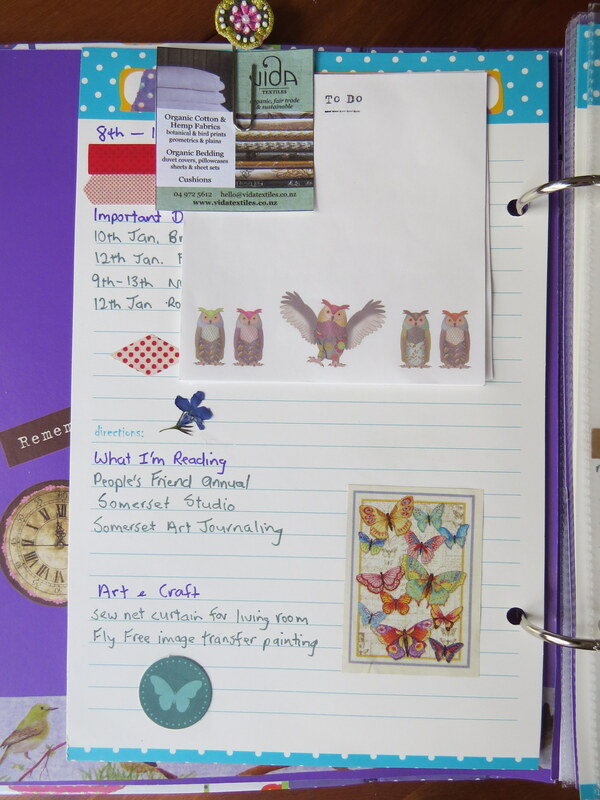 It is like a planner, journal, and scrapbook all in one. This is one of my favourite photographs of my grandmother. It would have been taken in the 1930s when she was in her twenties, before she married. I love her dress; I wish I knew what colour it was. Although when I think of my grandmother, I always think of her as old, I can see her in the face of this young woman, gentle and reflective. 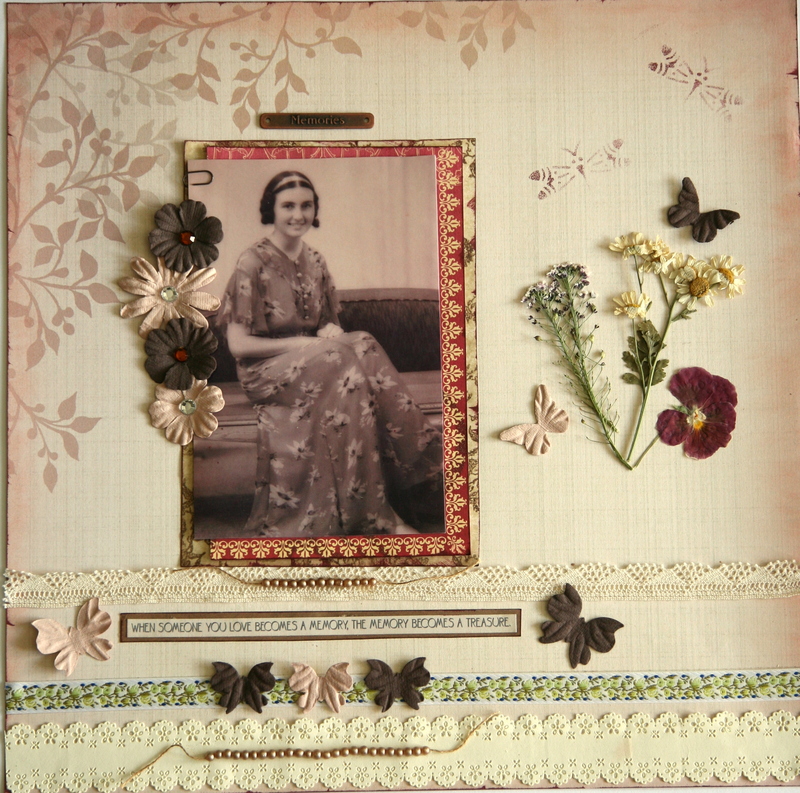 For this scrapbook page I used ribbon, lace, paper flowers and butterflies, and beads from a broken vintage necklace. 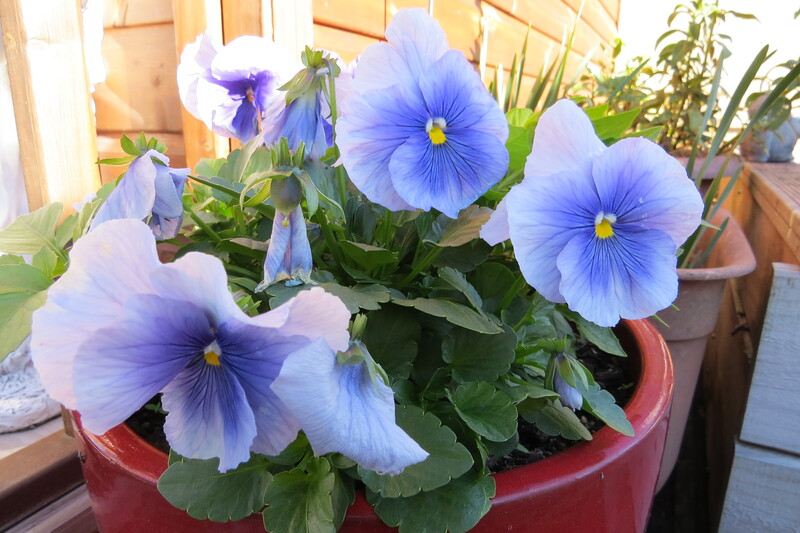 To honour my grandmother’s love of gardening, I added pressed flowers from my garden – alyssum, feverfew and pansy. 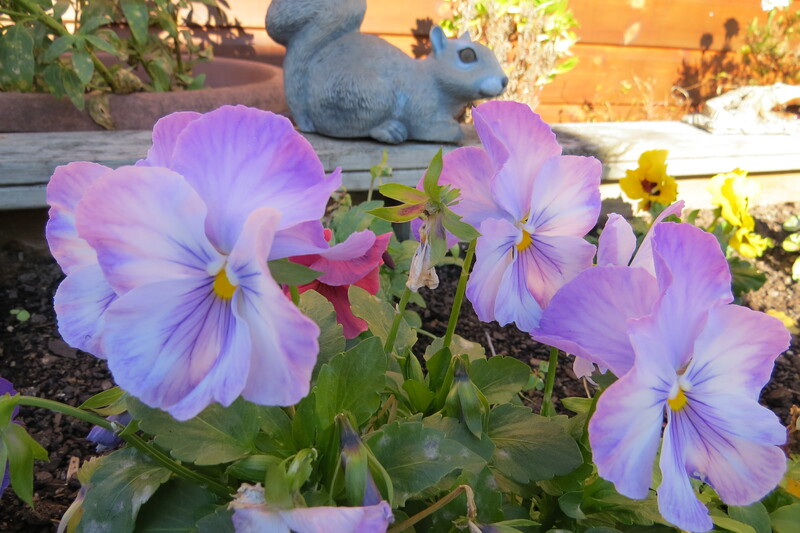 Originally posted on my Wattle Lane blog. My granddad was a special person in my life. Although, while I was growing up, we lived quite a distance from my grandparents, we would have a family holiday with them once a year, and I have some very fond memories of those holidays. Eventually we moved closer to them and, for the last few years of my grandfather’s life, he lived just around the corner from us. I remember him as a kind, gentle man with a great sense of humour and, what we thought at the time, some crazy ideas, always trying to come up with new inventions and ways of making his fortune. To me, he was an inspiration. He could play the piano by ear, never having learnt music, a skill I always envied. He took up painting later in life, creating many lovely works of art. I often wonder if I inherited my creative genes from his side of the family. 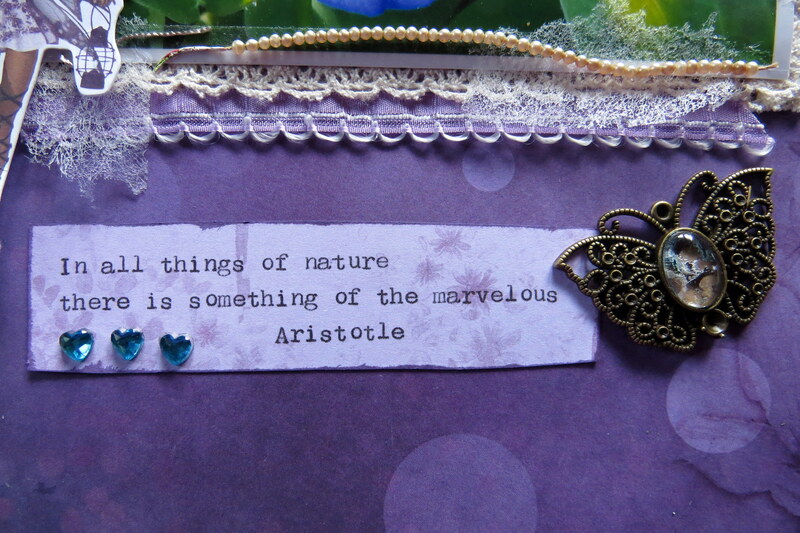 His sister, my great-aunt, was also an accomplished pianist, as well as dabbling in many different crafts. 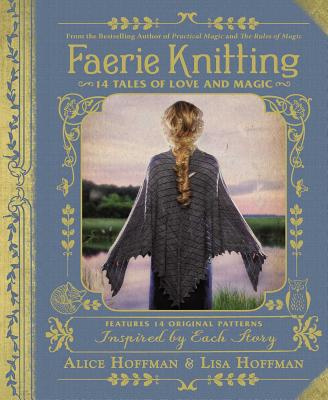 My mother sewed all our clothes when we were young, taught me how to knit and to do tapestry and cross-stitch, wrote pieces for magazines, and has encouraged me in all my creative endeavours. 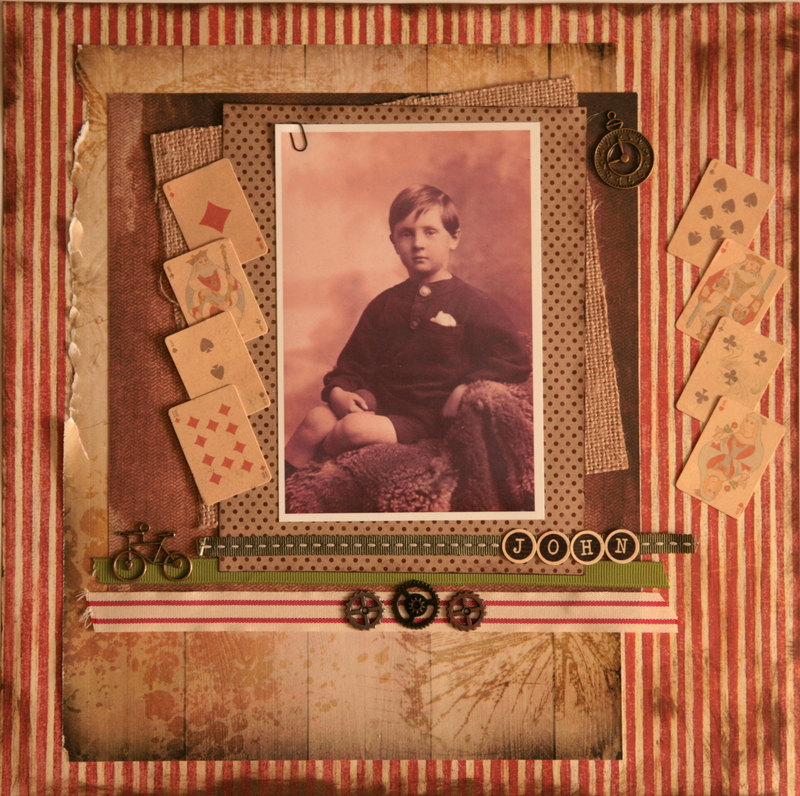 Creating this scrapbook page of my grandfather when he was young seemed like the perfect opportunity to use these tiny playing cards that I have had for a while. I have always loved this photograph of Granddad taken during the years of the Second World War. 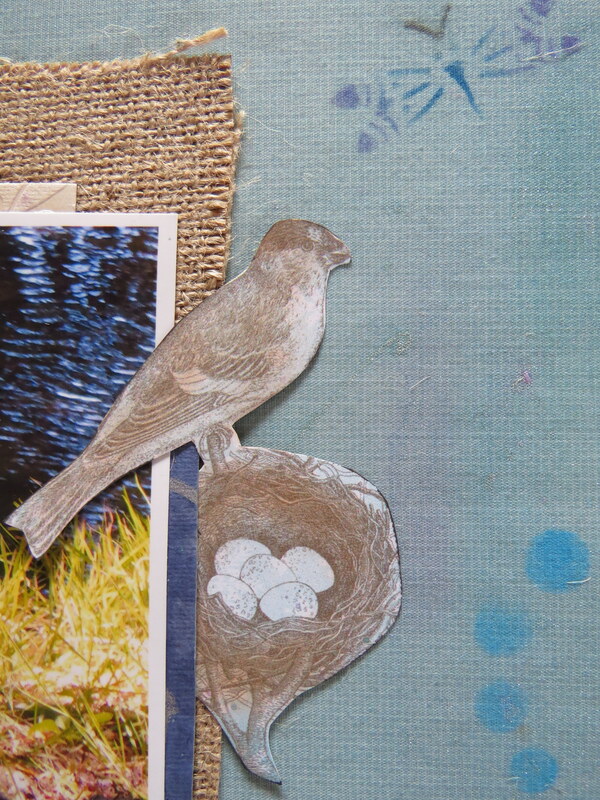 The music-themed background paper seemed perfect for celebrating his love of piano music.The background paper with the poem and the bird was a free artist paper from the Somerset Studio magazine. 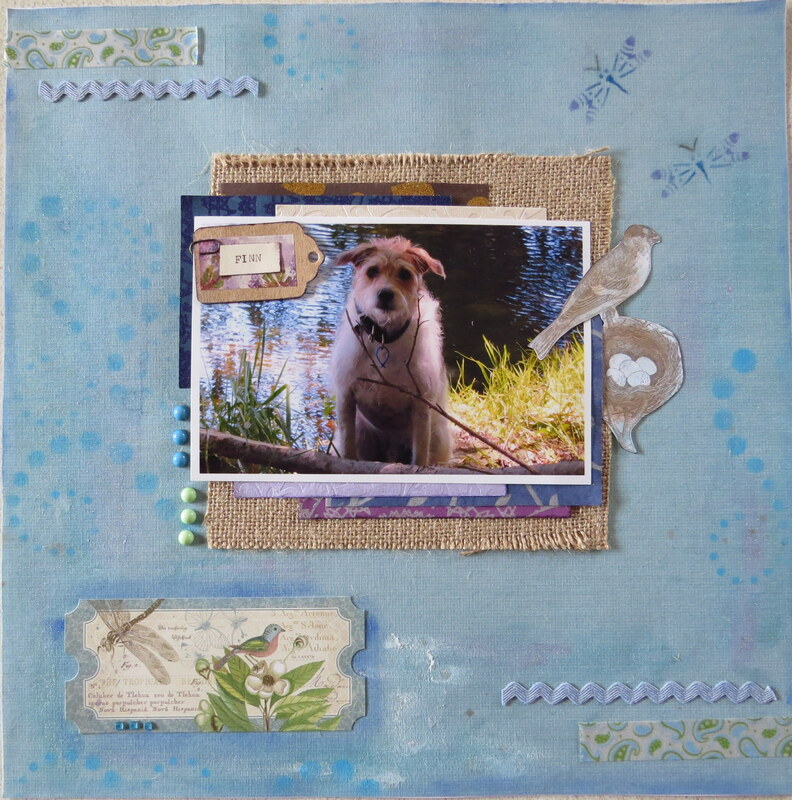 I added the green ribbons and stitching to add a pop of colour to the layout. I have many more photos of my grandfather taken over the years with his family, which I am looking forward to putting into scrapbook layouts to document his life and to remember the wonderful man who I was fortunate to have called my granddad. 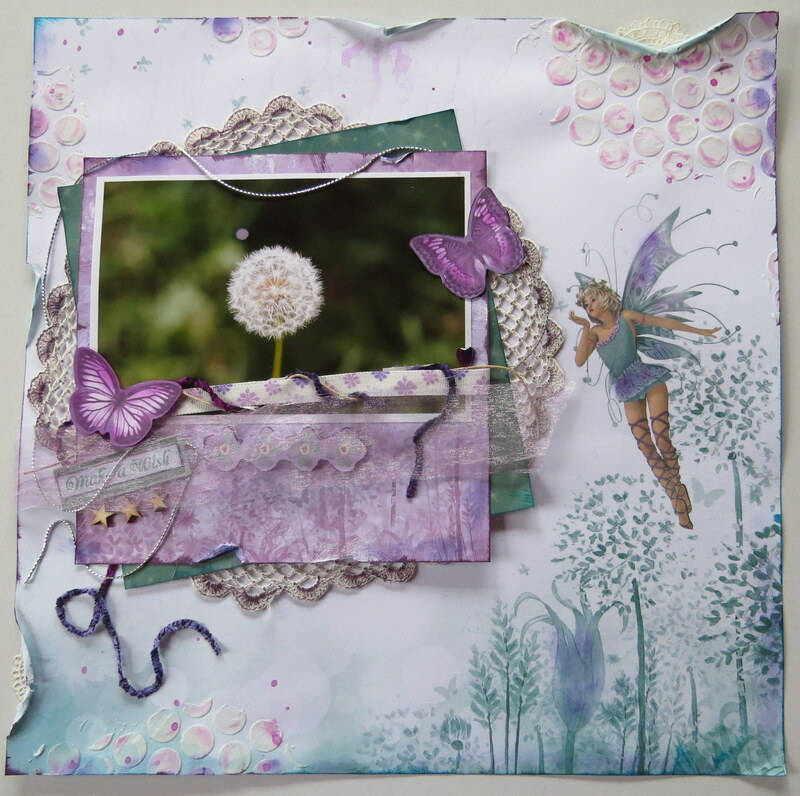 When I saw this pretty scrapbook paper from Kaisercraft’s Fairydust collection, I knew I had the perfect photo to go with it. It was one that Nick took a few years ago that I have always loved. 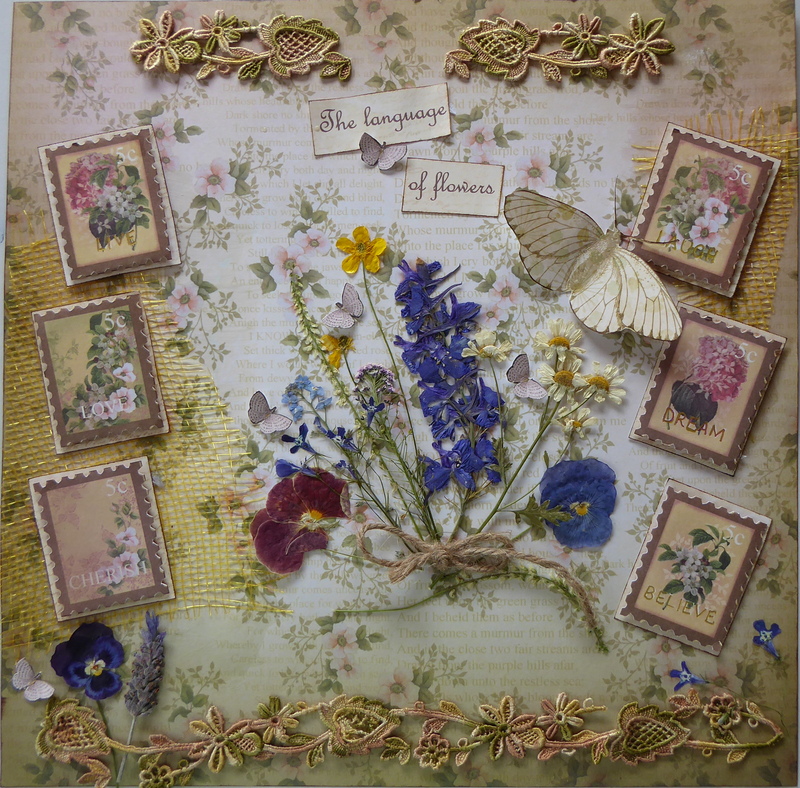 I added some honeycomb stencilling, ribbons and fibres, vintage lace, chipboard embellishments, and a few splashes of watercolour paint. 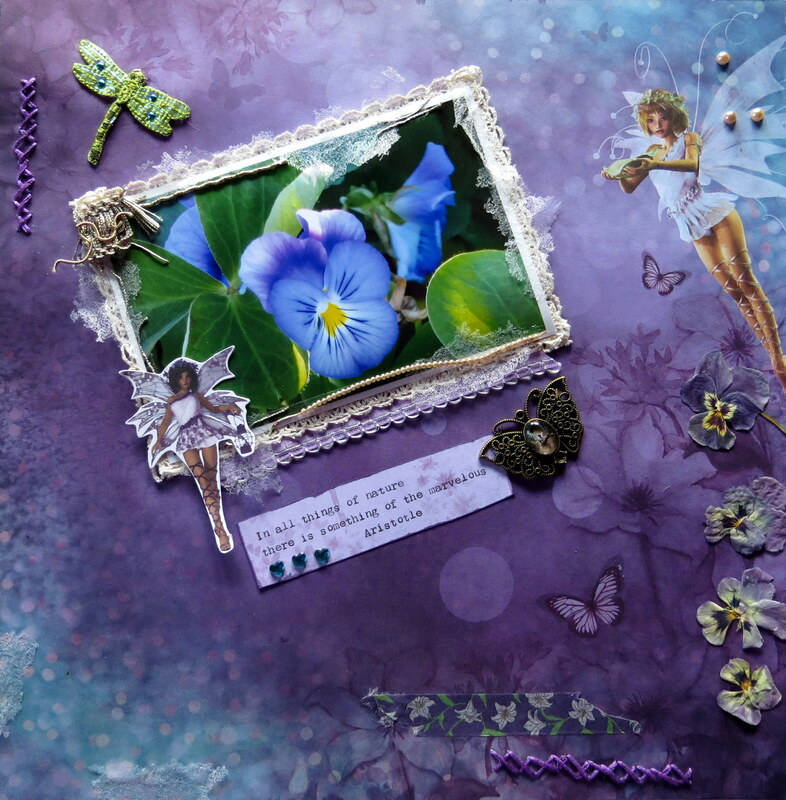 I hope this little garden fairy has added some whimsical delight to your day! Make my wish come true someday.